About one in eight Americans with HIV do not realize they are infected with the virus and those people account for nearly one-third of HIV transmissions in the United States, according to a Centers for Disease Control and Prevention report. The report, which was released Thursday and is the first to look at the prevalence of diagnosed and undiagnosed HIV infections at the state level, found by 2012 only Hawaii, New York, Connecticut, Delaware and Colorado met the White House's goal of having at least 90% of people who have HIV aware of their status. The White House set the goal in 2010. In 2011, there were an estimated 1.2 million people living with HIV and 14% of those​​ had undiagnosed infections. Because people unaware of their infections account for one-third of transmissions, the CDC wants to reduce those transmissions by expanding HIV testing and awareness. The most recent estimated cost of lifetime HIV treatment is $379,668. HIV, a virus spread through body fluids, affects specific cells of the immune system. HIV can destroy so many of these cells that the body can't fight infections, which can result in AIDS. The later someone is diagnosed, the higher the chances he or she develops AIDS. In 2012, more than 13,000 people died from AIDS. CDC researchers analyzed data from the National HIV Surveillance System and used a "back-calculation model" to estimate the total number of people with HIV. They subtracted the number of people diagnosed with HIV from the estimates to determine how many people are unaware of their status. They found infection rates ranged from 110 per 100,000 persons in Iowa to 3,936 per 100,000 in the District of Columbia. Louisiana had the lowest percentage of people aware they were HIV-positive, with 77%. In nine states, diagnoses were too few to make the data statistically stable. In 23 states and the District of Columbia, at least 85% of people living with HIV were aware of their status. Because the data were gathered from 2012, researchers say they are confident more states have reached the 90% goal. "Many of these states really started implementing appropriate programs to address these targets in late 2010, early 2011 so we're now only looking at the second year of this, so I expect that by 2015 we'll have a lot more states reaching that 90% target," said Eugene McCray, director of the division of HIV/AIDS prevention at the CDC. McCray said the CDC plans to release the state-level data annually. 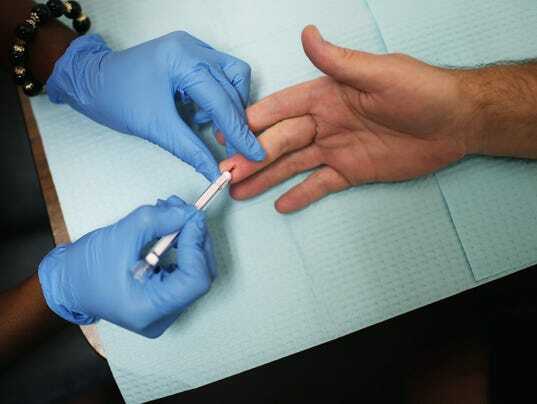 He added he hopes the report, which was released two days ahead of National HIV Testing Day, will raise awareness about the importance of getting tested. "These data underscore the need for ongoing efforts to increase testing and further reduce undiagnosed HIV infection so we're really targeting our efforts toward doing that," he said.